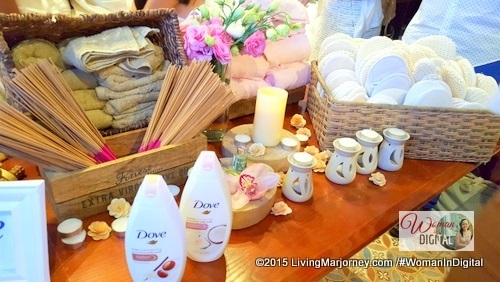 DOVE launched Purely Pampering Range available in beauty bars and nourishing body washes. 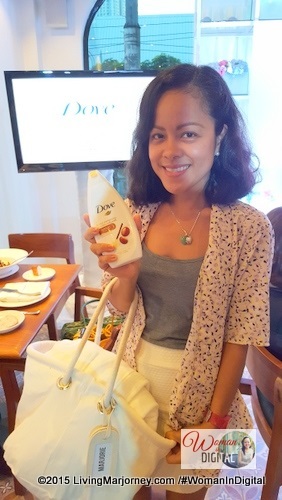 At the #DoveMeTime session, invited guests enjoyed an intimate purely pampering with back and hand massages using two new Dove beauty cream bars and Nourishing body washes variants. To be honest, I'm so excited to share this new discovery. I've been using these for a almost a week now and instantly became my favorite beauty soap. Our 'me time' started with a relaxing back massage. Afterwards, the therapist presented two unlabeled bottles of Nourishing Body Washes. I chose the light pink in color. She gently applied on the back of my hands to the arms and started to massage. The mild, coconut, feminine smell is too impossible not to be noticed. I super love the smell. After the massage Eunice of Bridges PR ushered us to the second floor for the short program. 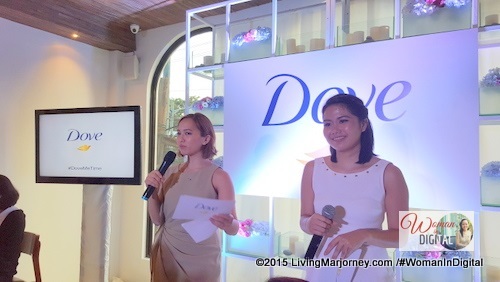 Celebrities and fellow bloggers, Patty Laurel Filart and Kelly Misa-Fernandez shared their experiences with the new Dove products. 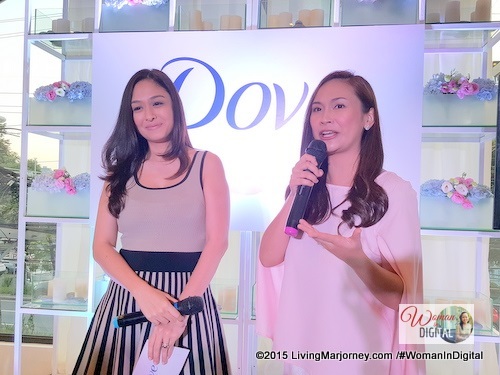 Not too long, they introduced the newest variants in their Nourishing body washes and beauty cream bars. 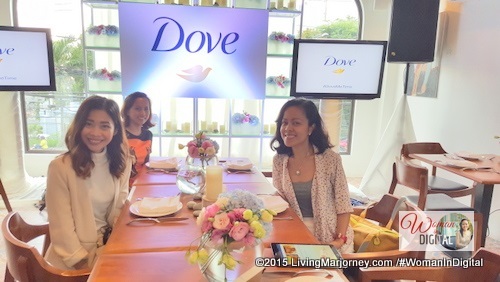 Dove invites us, women to indulge in one of the most relaxing forms of “Me Time” – the shower. 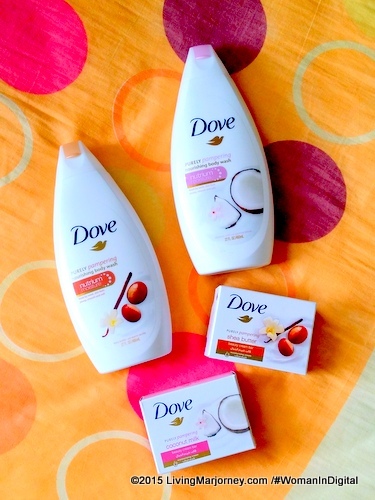 Its rich formula combines Dove’s unique NutriumMoistureTM technology with a blend of wholesome, skin-loving ingredients that envelope and moisturize skin with a full bodied lather and lovely scents, leaving you and your skin feeling balanced and renewed. We got excited when they invited us to check the display area. Some bathing paraphernalia every women would surely love. I grabbed a pink towel, aromatherapy oil and candles, scrubs and of course Dove Shea Butter and Warm Vanilla and Dove Coconut and Jasmine Nourishing Body Washes and Beauty bars. We also received a lovely white robe with our initials in it. Thanks Dove! 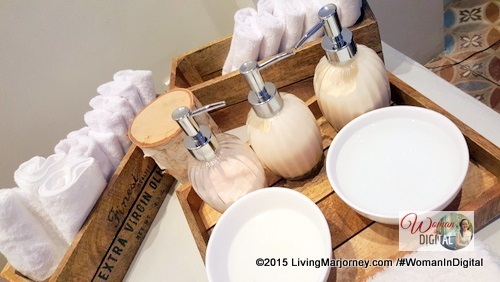 At the moment, I'm using the Shea Butter with Warm Vanilla and I'm liking the scent it leaves my bathroom. Even my husband notice the 'bagong ligo' scent. After shower, my skin feel soft to touch. It's non sticky, we can use it even on summer time. Because it has 1/4 moisturizer, it's recommended for people with sensitive and dry skin. 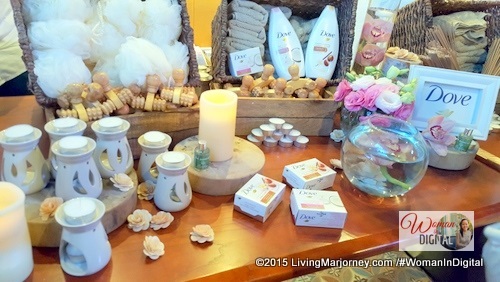 Dove Shea Butter with Warm Vanilla and Dove Coconut with Jasmine comes in beauty bars and nourishing body washes. They are now available at your favorite supermarket and beauty stores. By the way, all photos were taken using Samsung Note 5 #NextIsNow. I just love the phone's camera even on low light. It's great for taking selfie. Photo above was taken inside a moving #UberCar (use my promocode UberMarjorieUy and get a free ride using P200 credits on your first ride.